Four days over April in south-east Queensland on behalf of the museum and in a similar manner to my recent travel along the Murray River in Victoria, I have had discussions or inspections involving a diverse variety of craft over a short period. It began with a review of vessel and maritime scene watercolours in Brisbane, went on to an inspection of two historic vessels out of the water being restored, moved to one still in use, and finished with a lively exchange of experiences with Indigenous bark canoe construction. The watercolours are still under consideration so I am unable to reveal too much detail, but they come from an Australian who travelled widely in the late 19th and early 20th centuries and recorded his observations by hand as illustrations. The family is considering the long term location for this material so I took the opportunity to review it and note how it could be registered, conserved and eventually made available to the public if the collection came to us. These delightful maritime related images capture significant detail of vessels, people and scenes. 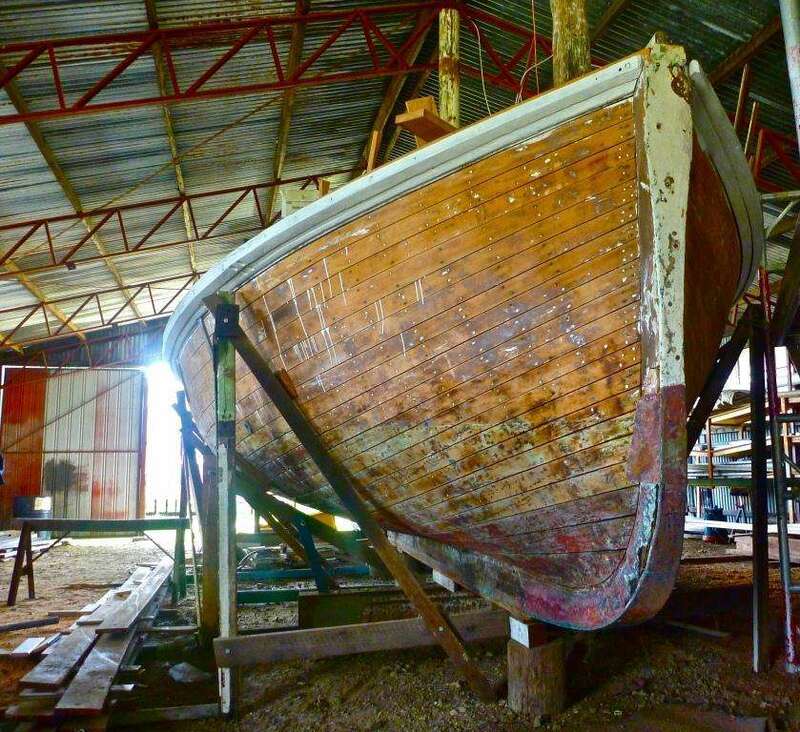 The next task was in Pimpana, inland from Southport, a MMAPSS funded vessel inspection and Vessel Management Plan discussion at Krawarree, the only surviving example of five 80 foot long, purpose built WWII era hospital vessels. Krawarree was commissioned as the war drew to a close and did not see active service. It is being restored by volunteers from the Southport community and shows how these craft were built and fitted out. One intriguing aspect is the arrangements for the wounded soldiers. The aft section from the engine room to the bosun’s locker at the transom had a raised aft deck overhead to give standing headroom, and on either side tiered racks were located to fit up to 30 stretchers. In the middle was a table with a long hatch above. The ship came close to shore or other smaller craft came alongside, and a boom went out the side of the ship to lift up the wounded servicemen in stretchers then lower them through the hatch onto the table where they were treated and then moved to the side. Some emergency operations may well have been carried out on that table, but essentially they were stabilized and moved on as quickly as possible to a shore facility. 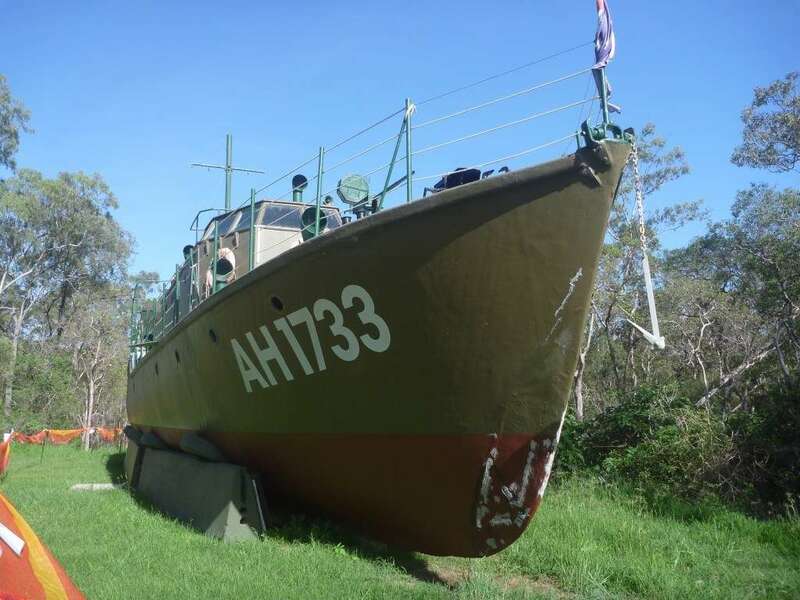 The ex-Queensland pilot vessel and general work launch Bunda-La in Caboolture Historical Village was the second MMAPSS vessel visited. Here again I reviewed their progress, Vessel Management Plan and schedule of work ahead. Included in the meeting were Peter Harman from the village, Bunda-La’s 84 year old builder Ken Broadhurst, and one of the key volunteers working on the project Horrie Hunt. Ken went through its history again, confirming some of the details we knew but outlining how it was built at the South Brisbane Dockyard where progress was gradual and mostly undertaken when the main dock work was not happening. The vessel is in great condition, much of the original hull is intact for the purpose of a static display, and the big work will be to rebuild the deck and superstructure. The deck is coming along well, and they have a well-planned approach to the project. The village site is a large expanse of buildings moved from nearby Caboolture and other localities, with a few recreations made to fill gaps. A number of sheds are open to the public with working and static displays of machinery and artifacts. From a WWI horse drawn army carriage, through trucks, cars, farm machinery, even Tom Walkinshaw’s 1985 Bathurst 1000 winning Jaguar. That evening in Noosa I went down to see a colleague who is also the owner of O-Dear, an original hire boat from the Noosa O-Boat hire business. Listed on the ARHV last year, it is a fine example of a craft still in use in its original location. We went to see one more that has been restored recently – another candidate for the ARHV. At 6.30am the next day we met again on the banks of the Noosa river for the launching of his new rowing scull he had just built, one of my Pittwater Scull designs. It was my pleasure to be the first to take it out for a trail run, and it rows well. 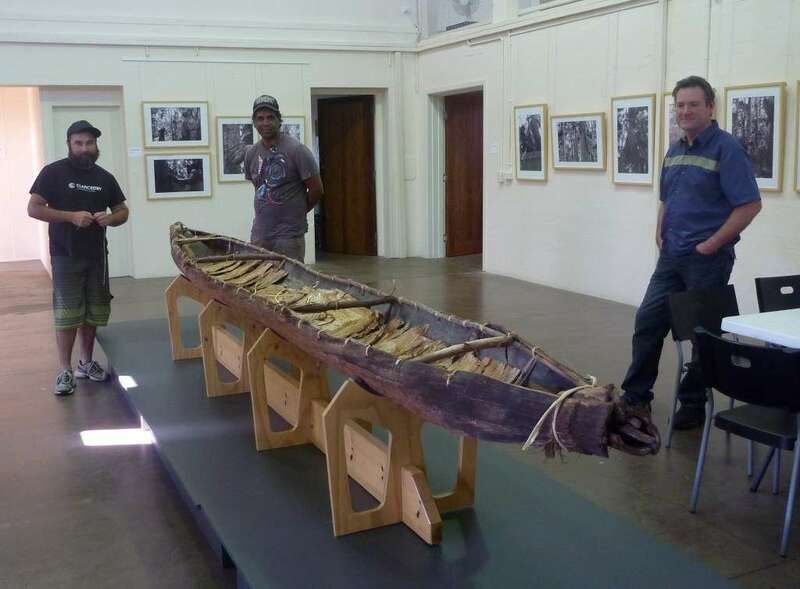 From there I went onto Cooroy to meet with Gubbi Gubbi canoe builders Lyndon Davies and Brett Miller who had made the bark canoe on display at the GubbiGubbi Gun’doo Yang’ga’man exhibition in Cooroy. John Waldron and Ray Kerkove were there, and Mariko Smith came up from Sydney to further her PhD research. It was a fantastic discussion about our shared experiences in bark canoe building, exchanging ideas and techniques and materials and how to work them, and discovering how we had often reached the same conclusion or idea independently. They had all been at the Nawi watercraft conference in 2012, which gave them the inspiration to build their own canoe, and more will happen I am sure. Back in Sydney and it is time to get on with report writing, but it is great to reflect on how much is the museum has been able to recognize, support or encourage in regional Australia.